I was in the town centre at lunchtime and popped into a charity shop on the off chance they had some used vinyl in there, they did, and it was mostly Cliff Richard and suchlike, about 20 albums that weren’t at all interesting, except for one, which was in a clear protective sleeve. it appears to be an original 1977 release of ‘Animals’ by Pink Floyd. As I didn’t have it I thought I’d pick it up. I took it to the counter and they charged me £1.45. At that price it was worth the risk that it was scratched to hell and didn’t play. As it turns out, it plays perfectly, so a bargain! In 1975 Pink Floyd bought a three-storey block of church halls at 35 Britannia Row in Islington, north London. Their deal with record company EMI, for unlimited studio time in return for a reduced percentage of sales, had expired, and they converted the building into a recording studio and storage facility. Its construction took up most of 1975, and in April 1976 the band started work on their tenth studio album, Animals, at the new facility. The album is very loosely based on George Orwell’s Animal Farm, the lyrics describing various classes in society as different kinds of animals: the combative dogs, despotic ruthless pigs, and the “mindless and unquestioning herd” of sheep. The album is more a critique of Capitalism than Stalinism though. 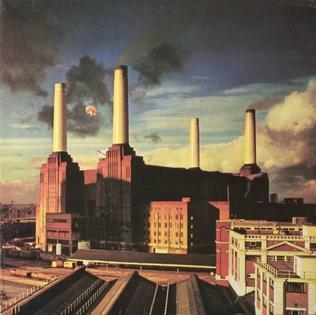 The album cover, by Hipgnosis (andschool friend Storm Thorgerson), was created in the days before Photoshop made things somewhat easier and in order to create the image of a pig flying over Battersea power station they actually had to fly a pig over Battersea power station! From Time Out: This week, we meet director Aubrey Powell, 66. Aubrey co-founded Hipgnosis, the design company behind some of the most iconic album covers of the ’70s – including Pink Floyd’s famous ‘Animals’ album cover, shot at Battersea Power Station. Tell us the story of that ‘Animals’ album cover. But the shoot didn’t quite go to plan, did it? Good thinking. What happened then? And you got the shot eventually.